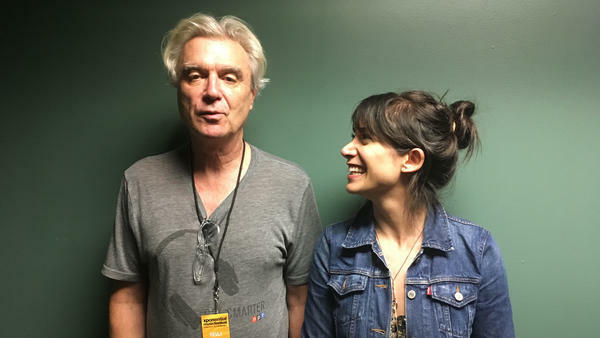 David Byrne (left) with World Cafe Host, Talia Schlanger (right) backstage at the 2018 XPoNential Music Festival. David Byrne opens his remarkable American Utopia show alone on stage, holding a model of a brain. He points to different parts as he sings the lyrics to "Here": "Here is a region of abundant details / Here is a region that is seldom used / Here is a region that continues living / Even when the other sections are removed." Our brains do all our thinking, but most of us seldom stop to think about how miraculous the organ truly is — and therein lies Byrne's artistic superpower. He finds wonder in unexpected or forgotten places and holds it up for us to stop and admire. Call him a wonder archaeologist. Byrne is fascinating because he is a person who is fascinated with the world. For proof, see all the projects, art installations and theater pieces he has created beyond the music you know from his Talking Heads days and solo albums. For further proof, see his preferred mode of travel: Byrne brings along dozen bicycles on the road so that he and intrepid tourmates can use them to explore new cities. He told me he likes bikes because they allow "a feeling of freedom that you're your own master you can do whatever you want, go wherever you want, stop whenever you want. "You could say the same of his entire career. During his visit to World Cafe, we spoke about the road that led him to American Utopia and why he closes each show with a cover of "Hell You Talmbout," Janelle Monáe's tribute to black victims of police violence. Hear our conversation in the audio player and read an edited version below. Talia Schlanger: When I think about your artistry, I think of someone who is able to not see borders and barriers, and will try to empathize or connect with any type of creature or non-creature out there. David Byrne: There are a lot of animals on this record. A friend said, "David, you've got too many chicken references." And chickens show up in at least two different songs. There's one where I think the lyric is "What is heaven to a chicken? Well there's plenty of roosters and lots of corn. That's heaven to a chicken." You're on tour right now, and being active is a huge part of your job on stage: The stage show you've got right now is so choreographed and so energetic. The musicians use wireless mics and aren't tethered by cords and cables, so they can do all this choreography and all this movement. Why is it so important to you that they can move around freely. I tried an incremental version of that on a tour I did with St. Vincent a number of years ago: We had a bunch of brass players and they were all untethered, they could move wherever. And I thought, "Could we take this further?" It's a really great feeling. "Could we do it with the drums and keyboards and everybody? "A little bit of experimenting and testing and yes, you can do it. It requires six players to get the sound of a full drum kit and percussion and all that. But it's, again, incredibly liberating. It means the stage is empty, we can move anywhere — and we do. We face one another, we do all kinds of stuff. Seeing it reminded me of my favorite theater experience I've ever had, which was seeing your show with Fatboy Slim, Here Lies Love. You took the story of the first lady of The Philippines, Imelda Marcos, and turned it into this electronic musical. But for the audience, we were all being ushered around the stage as it was moving and sort of part of the action. I feel like it says a lot about the way you approach art, or performance, as something that's alive. It's not necessarily something to be watched in a static sort of way. On this tour, the audience does tend to dance pretty soon. By the second, third song, they're usually up and dancing. And we don't tell them to do it, they just get up and do it. I think you do kind of tell them to do it with your own body, though. Do you ever get out of breath? [During] "Once in a Lifetime," I get out of breath. Not from the moving, but because in the vocal there's almost no breaths. Angélique Kidjo took on that song. Yeah, she did the whole album [Remain in Light]. I saw her maybe a year ago. She visited World Café and talked about that project recently, and the way she told that story of first performing that song with you, it sounded like you tried to go and see her show and she whisked you up onto the stage. Can you tell me the story from your perspective? I thought I was just going to be an audience member and enjoy myself, because she's such an incredible performer. And of course she spotted me and said, "You're coming down here!" You can't say no. What was it like? What did you feel? [Laughs] As a musician, my first thought is panicking — like, "What key are they doing it in? Do they do the same arrangement that we do?" To be honest, those are my first thoughts. Then it's like, "Okay, let's just let go and do it." The cadence and phrasing of her version are totally different. The songs are all totally recognizable, but she has adjusted them. When I saw her show, she did these segments between these songs where she sings in Yoruba, the language where she grew up. So she goes back to her African roots and relates that to this material, which I thought was incredibly flattering to me. While we're on Talking Heads, I really wanted to ask you about something that you said back in the '80s about singing. Granted, you did say it to a fake interviewer in a parody video for Stop Making Sense, but the line was, "The better the singer's voice, the harder it is to believe what they're saying." I think we've all occasionally heard an incredibly gifted singer, professionally gifted. They can hit every note, they can do all the runs — but somehow it doesn't connect emotionally. They can do everything perfectly but some essence is not going across. That's kind of what I was referring to. Sometimes if it's too easy, if the singer is naturally gifted in that way, they have to push to reach some deeper place — maybe not be perfect all the time — and allow a little bit of slippage to allow for the emotion and human connection to come through. How do you hear your own voice on that spectrum, from really believable to what you're describing? I think my own voice has gone from a not-totally-comfortable thing to listen to — there was a lot of kind of yelping going on, although that wasn't the way I heard it. I was really doing the best I could. Did it bother you then that people heard it as yelping? Yeah. They heard it as all this yelping and I thought, "Oh, I was trying to croon or sing in a normal voice or something. I guess it's not coming across the way I imagine, the way I'm hearing it in my head." Over the years, I think I have managed to get to where what comes out is a little closer to what I imagine. I can still do that, which I do occasionally, but I think I now have the range to do other things as well. One of the many things that you're working on right now is Reasons to Be Cheerful, which to me seems sort of like a world-scale art installation. Can you explain what it is and where it came from? It might be about two years ago now: I would wake up every morning and read the newspaper, [and] within half an hour or an hour, I'd be full of rage and upset or depressed or angry. I thought, "There's got to be an antidote to this. I can't function like this. Surely the world is not as bad as this." Little by little, if I saw an article about something that seemed hopeful, I started to save it into a folder. Over the last couple of years I found quite a bit. I labeled it "Reasons to be Cheerful," and I started doing these little talks where I would say "I found these things, I'm going to tell you about them." They fall into different categories. There's hopeful signs in education, or the rise in civic engagement from people running for office who've never run for office before — they're either a school teacher or this or that. In climate and energy there's things happening. It's non-partisan; I think it started out more partisan but I took all that out. One of the reasons to be cheerful, I think, has to do with American Utopia: Detroit, which is this wonderful project undertaken by students at the Detroit School of the Arts. They did a version of your song "Everybody's Coming to My House." Tell me the story of how they ended up taking that on. I was talking to my friend Eric [Welles Nyström] from Luaka Bop Records ... It was his idea. He said, "Why don't you have all these other communities do something for your songs?" 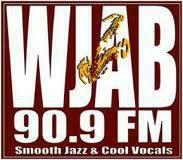 The first one we did was a choir from a school in Detroit, and they interpreted this song. When I heard their version — there's a piano, but it's more or less a capella — I thought it changed the meaning of the song, for the better. In my version, to me it sounds like I have this trepidation about all these people coming over to my house. For them, it's the opposite: It's welcoming. It's like, "Yes, come on over. We all do live in the same metaphorical house; let's join together." I want to talk about how you end the show you're touring right now. In a lot of cities, you've closed with a version of the song "Hell You Talmbout" from 2015, by Janelle Monáe and her Wondaland Collective. The lyrics are the chanted names of black Americans killed by police or vigilantes, followed by the phrase "Say his name" or "Say her name." Why did you want to end your current show with that song? I felt that the trajectory of our show implies more social and political engagement from me — and possibly from the audience, but certainly from me and the band. In the times that we live in now, I felt we were kind of obliged to be more engaged in that way. Three years ago, in 2015, I heard the song she did — and she [also] did it at the Women's March in Washington. I just thought, "This is one of the most moving political songs that I'd ever heard." I was surprised that it didn't catch fire and you didn't hear it everywhere. So when it came [to it], I thought,"How are we going to end this show? It seems to be going in this direction." I got in touch with her to say, "I'd like to do your song. Does it seem weird for a slightly older white man to be doing this song?" And she said "No, no, no. This is great." She said something like, "This song should belong to everyone. Everyone should be able to do this song." Tell me what you see from your perspective on stage when you sing it. What's happening in the audience? One of the beautiful things about the song is it's not accusatory. There's an implication that there is a lack of social justice, but it's not accusing the audience, it's not pointing a finger at any specific person or group. It's saying that something's not right and giving tribute, remembrance, to these lives that are gone. At that point, we've had the high points of the show where the audience is dancing and they're having a great time. Then we keep the groove going, but it gets quite serious. It ends the show on the vibe of, "This is where we are at in 2018." That's a fascinating arc. I think about the way you open the show, you're examining a human brain alone on stage with the song "Here," and pointing out all these regions in the brain and taking us into this world where people can forget everything that's going on outside and be part of this amazing spectacle. To bring it back out at the end ... people in the audience can't help but say the names along with you, and the act of doing that is remarkable. When you say the names, you can picture these people, the people who were killed. Sometimes it's really hard to sing. Would you pick a song of yours, any song you'd like, for us to go out on? There's one from a number of albums back called "Everyone's in Love with You." I don't often sing my own songs [in private], but I was singing that one last night. Why? What about that song? I was singing it to myself as I was riding home from dinner on my bike. I was thinking, was I writing about myself, or was I writing about a person I was having a relationship with, who seemed much more socially adept than I felt? [They] seemed at ease with groups of people and making conversation with everyone. I felt a little awkward about that, and the song is about that. I'm singing it to myself thinking, could it also be the way other people think about me? Well, you're a well-loved celebrity, if I can use that word. Because I don't think of myself that way. But maybe other people think of me that way.